Implemented on August 31, 2017, this Framework removes the restriction on fishing for, or retaining the recreational bag and possession limits of king and Spanish mackerel on a vessel with a Federal commercial permit for king or Spanish mackerel when commercial harvest of king or Spanish mackerel in a zone or region is closed. The amendment revises the Gulf migratory group king mackerel annual catch limits and the Gulf migratory group king mackerel commercial zone quotas. Finally, the amendment increases the recreational bag limit to 3-fish per person. This framework action increases the commercial trip limit to 45,000 pounds. The action also: establishes a payback provision if the Florida West Coast Southern Subzone gillnet annual catch limit is exceeded; and allows commercial king mackerel gillnet permits to be renewed only if landings for a single year during 2006-2015 were greater than one pound. Permits that do not qualify will be non-renewable and non-transferable. This final rule is effective January 19, 2016. Amendment 20B proposed to 1) remove the trip limit reductions for Gulf migratory group king mackerel in the Florida west coast Northern and Southern Subzones, 2) adjust the fishing season for Gulf migratory group king mackerel in the Florida west coast Northern Subzone, 3) allow transit of vessels with king mackerel through areas closed to king mackerel fishing, 4) create regional quotas for Atlantic migratory group king and Spanish mackerel and allow transfer of quota between zones, 5) modify the framework procedure for the FMP, and 6) create an East Coast Zone for Gulf migratory group cobia with a separate annual catch limit, which will be managed by the South Atlantic Fishery Management Council (SAFMC) because it is within their jurisdictional boundaries. This final rule is effective March 1, 2015. This rule modifies the annual catch limits (ACLs) for Atlantic and Gulf migratory groups of Spanish mackerel and modifies the recreational annual catch target (ACT) for Atlantic migratory group Spanish mackerel, based on the results of the most recent stock assessments for these stocks. Framework Amendment 1 also specifies the optimum yield and acceptable biological catch (ABC) estimates for Atlantic and Gulf migratory groups of Spanish mackerel. The purpose of this rule is to update ACLs based on the best scientific information available and to ensure overfishing does not occur for Spanish mackerel. This final rule is effective December 22, 2014. Actions in this amendment address issues associated with coastal migratory pelagic (CMP) permits, including whether to require commercial permits for sale of fish caught under the bag limit, eliminate some permits, and modify conditions for obtaining and holding permits. This final rule is effective July 16, 2014, except for the amendments to § 622.386(d) and (e), which are effective August 7, 2014. This amendment consolidates the existing South Atlantic and Gulf of Mexico federal dealer permits and requires permits for dealers who currently are not required to have one. The amendment additionally increases the frequency of federal dealer reporting from monthly to weekly and establishes requirements to maintain a federal dealer permit. This amendment modifies the frequency of headboat reporting to be on a weekly basis (or intervals shorter than a week if notified by the Science and Research Director) via electronic reporting, and will be due by 11:59 p.m., local time, the Sunday following a reporting week. If no fishing activity occurs during a reporting week, an electronic report so stating must be submitted for that week. Establishes annual catch limits (ACL) and accountability measures (AM) for Gulf group cobia, king mackerel, and Spanish mackerel. The amendment was implemented December 29, 2011 and became effective January 30, 2012. It also removes cero, little tunny, dolphin, and bluefish from the fishery management plan, revises the framework procedure, and separates cobia into Atlantic and Gulf migratory groups. Establishes a limited access system on for-hire reef fish and coastal migratory pelagics (CMP) permits. Permits are renewable and transferable in the same manner as currently prescribed for such permits. The Gulf Council will have periodic review at least every 10 years on the effectiveness of the limited access system. This final rule became effective June 15, 2006. The 2003 regulatory amendment, implemented on May 14, 2003, establishes definitions of maximum sustainable yield (MSY), optimum yield (OY), the overfishing threshold, and the overfished condition for Cobia and Gulf grouper king and Spanish mackerel. Amendment 15 to the coastal migratory pelagic (CMP) fishery management plan (FMP) in the Atlantic and Gulf of Mexico proposes to establish two actions. Action 1 establishes an indefinite limited access program for the king mackerel fishery in the exclusive economic zone under the jurisdiction of the Gulf of Mexico (GMFMC), South Atlantic (SAFMC), and Mid-Atlantic Fishery Management Councils (MAFMC). Establishment of a limited access system that caps participation at the current level provides for long-term social and economic stability in the mackerel fisheries. Action 2 changes the fishing season to March 1 through February 28/29 for the Atlantic groups of king and Spanish mackerel. Beginning the fishing year on March 1 ensures the mackerel fisheries in the Atlantic are open during March when several other fisheries are closed. This final rule is effective August 8, 2005. Amendment 14, implemented July 29, 2002, established a 3-year moratorium on the issuance of charter vessel and head boat permits unless sooner replace by a comprehensive effort limitation system. The control date for eligibility was established as March 29, 2001. Also includes other provisions for eligibility, application, appeals, and transferability. This final rule is effective July 29, 2002, except for the revisions to Secs. 622.5(b)(1) and 622.43(a)(3)(ii), which are effective December 26, 2002. Amendment 13, implemented August 19, 2002, established two marine reserves in the exclusive economic zone (EEZ) in the vicinity of the Dry Tortugas, Florida known as Tortugas North and Tortugas South in which fishing for coastal migratory pelagic species is prohibited. This action complements previous actions taken under the National Marine Sanctuaries Act. Amendment 12 proposes to extend the commercial king mackerel permit moratorium from its current expiration date of October 15, 2000 to October 15, 2005, or until replaced with a license limitation, limited access, and/or individual fishing quota or individual transferable quota system, whichever occurs earlier. This final rule is effective on October 2, 2000. Amendment 11 included proposals for mackerel in the South Atlantic Fishery Management Council (SAFMC)’s Comprehensive Amendment Addressing Sustainable Fishery Act Definitions and other Provisions in Fishery Management Plans of the South Atlantic Region. This final rule is effective September 6, 2002, except for the addition of Sec. 622.4(a)(2)(xi) and the revision of Sec. 622.6(a)(1)(i) which are effective December 5, 2002. The 2000-2001 regulatory amendment, implemented on April 30, 2001, reduced total allowable catch (TAC) from 10.6 MP to 10.2 MP, provided a 2-fish bag limit for the captain and crew of for-hire vessels, and revised the trip limit for Gulf migratory group king mackerel in the northern area of the Eastern Zone (Miami-Dade through Volusia Counties, Florida) to remain at 50 fish until February 1. If the quota is not 75 percent filled as of February 1, then the trip limit will increase to 75 fish; if the quota is 75 percent filled or greater, then the trip limit will remain at 50 fish. Amendment 10 incorporated essential fish habitat (EFH) provisions for the South Atlantic Fishery Management Council (SAFMC). This final rule is effective on July 14, 2000. The regulatory amendment for the 1999-2000 season proposed to retain total allowable catch (TAC) for Gulf group king mackerel at 10.6 million pounds. It also proposed to establish a 2-fish per person per day bag limit on Gulf group king mackerel for the captain and crew of for-hire vessels and retain this 2-fish bag limit for all other recreational fishermen; however, the captain and crew bag limit was rejected by NMFS. The fishing season for the commercial gill net fishery for Gulf group king mackerel was changed to open at 6 a.m. eastern standard time (EST) on the Tuesday following the Martin Luther King, Jr. holiday, with the following weekend open as long as the quota has not been taken, and all subsequent weekends and holidays would be closed as long as the season remains open. Weekend and holiday closures would be from 6 a.m. Saturday to 6 a.m. Monday EST (or Tuesday if a Monday holiday is involved), and during this period, boats with a net on board must be tied to the dock. The TAC for Gulf group Spanish was changed from 7.0 million pounds to 9.1 million pounds, and the bag limit for Gulf group Spanish was increased from 10 to 15 fish per person per day. This final rule is effective on September 20, 1999. Amendment 9, would reallocate the percentage of the commercial allocation of total allowable catch (TAC) for the North Area (Florida east coast) and South/West Area (Florida west coast) of the Eastern Zone to 46.15% North and 53.85% South/West, as well as retain the recreational and commercial allocations of TAC at 68% recreational and 32% commercial. It will subdivide the commercial hook-and-line king mackerel allocation for the Gulf group, Eastern Zone, and South/West Area (Florida west coast) by establishing 2 subzones with a dividing line between the 2 subzones at the Collier/Lee County line. It will establish regional allocations for the west coast of Florida based on the 2 subzones with 7.7% of the Eastern Zone allocation of TAC being allowed from Subzone 2 and the remaining 92.3% being allocated as follows: 50% – Florida east coast; 50% – Florida west coast; 50% – Net Fishery; 50% – Hook-and-Line Fishery. A trip limit of 3,000 pounds per vessel per trip for the Western Zone will be established, as well as a moratorium on the issuance of commercial king mackerel gill-net endorsements. It will allow re-issuance of gill-net endorsements to only those vessels that: (1) had a commercial mackerel permit with a gill-net endorsement on or before the moratorium control date of October 16, 1995 (Amendment 8), and (2): had landings of king mackerel using a gill net in one of the two fishing years 1995-96 or 1996-97 as verified by NMFS or trip tickets from the FDEP; allow transfer of gill net endorsements to immediate family members (son, daughter, father, mother, or spouse) only; and prohibit the use of gill nets or any other net gear for the harvest of Gulf group king mackerel south of an east/west line at the Collier/Lee County line. The minimum size limit will increase for Gulf group king mackerel from 20 inches to 24 inches fork length. (FL) and the retention and sale of cut-off (damaged) legal-sized king and Spanish mackerel will be allowed. This final rule is effective April 27, 2000. Increased the income requirement for a king or Spanish mackerel permit to 25 percent of earned income or $10,000 from commercial sale of catch or charter or head boat fishing in 1 of the 3 previous calendar years, but allowed for a 1-year grace period to qualify under permits that are transferred; Legalized retention of up to 5 cut-off (barracuda damaged) king mackerel on vessels with commercial trip limits; Set an optimum yield (OY) target at 30 percent static SPR; Provided the SAFMC with authority to set vessel trip limits, closed seasons or areas, and gear restrictions for Gulf group king mackerel in the North Area of the Eastern Zone (Dade/Monroe to Volusia/Flagler County lines); Established various data consideration and reporting requirements under the Framework Procedure. Modified the seasonal framework adjustment measures and specifications (see Appendix I). This final rule is effective April 3, 1998, except that changes to § 622.4 are effective March 4, 1998. For the 1998/99 season the amendment proposes to retain the total allowable catch (TAC) for the Gulf group king mackerel, but to set the bag limit for captain and crew of charter and head boats at zero. The size limit for king mackerel would increase to 24 inches (FL). The commercial king mackerel hook-and-line trip limit for the western zone (AL-TX) would be set at 3,000 pounds per trip. This final rule is effective February 19, 1998, except for the revision of § 622.44(a)(2)(i) which is effective February 24, 1998, and for the addition of introductory text at § 622.44(a)(1) and the revision of § 622.44(a)(1)(iii) which are effective March 23, 1998. For the 1997/98 season the total allowable catch (TAC) was increased to 10.6 MP for Gulf group king mackerel. The zero bag limit for captain and crew of charter and head boats was rescinded. The commercial hook-and-line trip limit for the Florida East Coast Zone (FECZ) was changed to 50 fish until the subquota was taken. The TAC and bag limits remained unchanged for Gulf group Spanish Mackerel. For the 1996/97 season the total allowable catch (TAC) and bag limits remained unchanged for Gulf group king mackerel, except that the bag limit for captain and crew of charter and head boats was set at zero. The commercial hook-and-line trip limit for the Florida West Coast Zone (FWCZ) was set at 1,250 pounds per trip until 75% of the subquota was taken and then changed to 500 pounds per trip. Florida East Coast Zone (FECZ) set at 750 pounds then to 500 pounds when 75% taken. TAC for Gulf group Spanish mackerel was reduced to 7.0 MP and the bag limits remained unchanged. This final rule is effective June 2, 1997. For the 1995/96 season the total allowable catch (TAC) and bag limits remained unchanged for Gulf group king and Spanish mackerels. The hook-and-line trip limit for the Florida West Coast Zone (FWCZ) of the eastern zone was set at 125 fish until 75% of the subquota was taken, then it became 50 fish. Amendment 7, implemented in September 1994, equally divided the Gulf commercial allocation in the Eastern Zone at the Dade-Monroe County line in Florida. The suballocation for the area from Monroe County through Western Florida is equally divided between commercial hook-and-line and net gear users. This final rule is effective September 23, 1994 except that the amendment to § 204(b) is effective August 24. 1994; § 642.4(m) is effective August 24. 1994. except for § 642.4(m)(4), which is effective August 24, 1994 through October 31. 1994: and §642.7(t)(u), and (v) and 642.28(b)(2) are effective November 1, 1994. For the 1994/95 season the total allowable catch (TAC) and bag limits remained unchanged for Gulf group king mackerel. Commercial gill net boats fishing king mackerel in the eastern zone were limited to 25,000 pounds per trip. The TAC and bag limits for Gulf group Spanish mackerel remained unchanged. Florida East Coast Zone (FECZ) modified to 50 fish until 25% of subquota is taken. Emergency action added 300,100 pounds under 125-fish trip limit. This final rule is effective November 21, 1994. For the 1993/94 season the total allowable catch (TAC) and bag limits remained the same for Gulf group king mackerel. For the eastern zone (FL) commercial hook-and-line fisheries the trip limit for the Florida East Coast Zone (FECZ) was set at 50 fish until 50% of the subquota was taken and then was reduced to 25 fish until the quota was taken. For the Florida West Coast Zone (FWCZ) there was no trip limit until 75% of the subquota was taken then was reduced to 50 fish. The TAC and bag limits for Gulf group Spanish mackerel remained unchanged. This final rule is effective November 1, 1993. Amendment 6, implemented in November of 1992, made the following changes: Identified additional problems and an objective in the fishery; Provided for rebuilding overfished stocks of mackerels within specific periods; Provided for biennial assessments and adjustments; Provided for more seasonal adjustment actions, including size limits, vessel trip limits, closed seasons or areas, and gear restrictions; Allowed Gulf group king mackerel stock identification and allocation when appropriate; Provided for commercial Atlantic Spanish mackerel possession limits; Changed commercial permit requirements to allow qualification in one of three preceding years; Discontinued the reversion of the bag limit to zero when the recreational quota is filled; Modified the recreational fishing year to the calendar year; and Changed the minimum size limit for king mackerel to 20 inches FL, and changed all size limit measures to fork length only. This final rule is effective December 3, 1992, except that 64 2.23(a}(3) is effective December 3, 1992, through January 3, 1993. For the 1992/93 season the amendment increased total allowable catch (TAC) for Gulf group king mackerel to 7.8 MP with commercial quota of 2.50 MP and recreational allocation of 5.3 MP. The king mackerel bag limit was reduced to 2 fish per person including captain and crew of charter and head boats for the entire Gulf exclusive economic zone (EEZ). The TAC for Gulf group Spanish mackerel remained at 8.6 MP. The bag limits were increased to 7 fish off TX, and 10 fish off FL-LA. 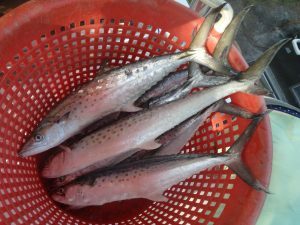 The amendment deleted the requirement that the bag limits for Gulf group king and Spanish mackerels revert to zero when the allocations were projected to be harvested and the fisheries be closed. Emergency action added 259,000 pounds under 25-fish trip limit. This rule is effective September 18, 1992. For the 1991/92 season the amendment increased total allowable catch (TAC) for Gulf group king mackerel to 5.75 MP with a 1.84 MP commercial quota and 3.91 MP recreational allocation. The king mackerel bag limit was modified to 2 fish off Florida and 2/3 AL-TX (See 1986/87 regulatory amendment for description). The TAC for Gulf group Spanish mackerel was increased to 8.6 MP and the bag limit modified to 3 fish off TX, 5 fish off FL, and 10 fish off AL-LA. The amendment also set the overfishing thresholds at 30% SPR (SSBR). This final rule is effective September 4, 1991. For the 1990/91 season the amendment left the total allowable catch (TAC) (4.25 MP) and bag limit for Gulf group king mackerel unchanged. The TAC (5.25 MP) for Gulf group Spanish mackerel was unchanged. The bag limits for Spanish mackerel were changed to 4 fish off FL, 3 fish off TX, and 10 Fish off AL-LA at the request of the states. This final rule is effective August 1, 1990, except that revised § 642.28(a)(1)(iii)(B) and (a)(5)(ii) and new § 642.28(a)(1)(iii)(C) are effective August 20, 1990, and revised § 642.28(a)(1)(iii)(A) and (a)(1)(iv)(A) are effective January 1, 1991. Redefined recreational bag limits as daily limits; Deleted a provision that specified that bag limit catches of mackerel may be sold; Provided guidelines for corporate commercial vessel permits; Specified that Gulf group king mackerel may be taken only by hook-and-line and run-around gill nets; Imposed a bag limit of two cobia per person per day for all fishermen; Established a minimum size of 12-inch (30.5 cm.) fork length (FL) or 14-inch (35.6 cm.) total length (TL) for king mackerel and included a definition of “conflict” to provide guidance to the Secretary. This final rule is effective August 20, 1990. For the 1989/1990 season the amendment increased total allowable catch (TAC) for Gulf group king mackerel to 4.25 MP with commercial quota 1.36 MP and recreational allocation 2.89 MP. The bag limit remained unchanged. The TAC for Gulf group Spanish mackerel was increased to 5.25 MP. The allocation ratio between commercial (57%) and recreational (43%) remained unchanged as did the bag limit. This final rule is effective is July 1, 1989. Amendment 4 with Environmental Assessment (EA), implemented in 1989, reallocated Spanish mackerel equally between recreational and commercial fishermen on the Atlantic group with an increase in total allowable catch (TAC). This final rule is effective September 18, 1989. Amendment 3 with Environmental Assessment (EA), was partially approved in 1989, revised, resubmitted, and approved in 1990. It prohibited drift gill nets for coastal pelagics and purse seines for the overfished groups of mackerels. This final rule is effective August 14, 1989. For the 1988/89 season the amendment set total allowable catch (TAC) for Gulf group king mackerel at 3.4 MP with commercial quota of 1.1 MP and recreational allocation 2.3 MP. The commercial quota was allocated 69% to eastern zone (FL) and 31% to western zone (AL-TX). The TAC for Gulf group Spanish mackerel was increased to 5.0 MP allocated 43% to recreational sector and 57% to commercial sector. The Spanish mackerel bag limit was set at 4 fish off Florida and 10 fish off AL-TX. This final rule is effective July 1, 1988. Amendment 2 with Environmental Assessment (EA), implemented in July of 1987, revised Spanish mackerel maximum sustainable yield (MSY) downward, recognized two migratory groups, and set commercial quotas and bag limits. Charterboat permits were required, and it was clarified that total allowable catch (TAC) for overfished stocks must be set below the upper range of acceptable biological catch (ABC). The use of purse seines on overfished stocks was prohibited. This final rule is effective June 30, 1987, except 642.7(a)(31) which is effective August 24, 1987. For the 1987/88 season (July 1 – June 30) the amendment reduced total allowable catch (TAC) for Gulf group king mackerel to 2.2 MP with commercial quota of 0.7 MP and recreational allocation of 1.5 MP. The purse-seine allocation was set at zero. TAC for Gulf group Spanish mackerel was set at 2.5 MP with a commercial quota of 1.4 MP and recreational allocation for 1.1 MP. The bag limit for Spanish mackerel was set at 3 fish. This final rule is effective June 30, 1987. Allowed charter boats to obtain commercial permits. For the 1986/87 season (July 1 – June 30) the amendment set total allowable catch (TAC) for Gulf group king mackerel at 2.9 MP with 0.93 MP commercial quota and 1.97 MP recreational allocation. The king mackerel bag limit was set at 2 fish for persons fishing from boats without a captain and crew and 3 fish for persons fishing from boats with a captain and crew (i.e., for-hire boats), the crew excluded. The commercial quota was allocated 6% for purse-seines, 64.5% for eastern zone (Florida) and 29% for western zone (AL-TX). The amendment also provided that the recreational and commercial fisheries would be closed when their allocation was taken. Amendment 1 and its Environmental Impact Statement (EIS), implemented in September of 1985, provided a framework procedure for pre-season adjustment of total allowable catch (TAC), revised king mackerel maximum sustainable yield (MSY) downward, recognized separate Atlantic and Gulf migratory groups of king mackerel, and established fishing permits and bag limits for king mackerel. Commercial allocations among gear users were eliminated. The Gulf commercial allocation for king mackerel was divided into eastern and western zones for the purpose of regional allocation. This final rule is effective September 22, 1985. The Fishery Management Plan (FMP) for Coastal Migratory Pelagic Resources of the Gulf of Mexico and South Atlantic and Environmental Assessment (EA), approved in 1982 and implemented by regulations effective in February of 1983, treated king and Spanish mackerel each as one U.S. stock. Allocations were established for recreational and commercial fisheries, and the commercial allocation was divided between net and hook-and-line fishermen. This final rule is effective February 4, 1983.